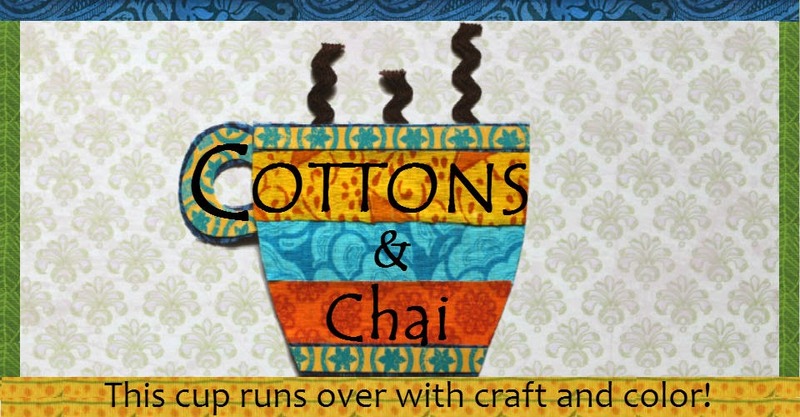 Welcome, dear reader, looks like we've reeled you in today to visit our crafty little blog! This Monday we wrote about our very first entry of A Rainy Day quilt at the Blogger's Quilt Festival. 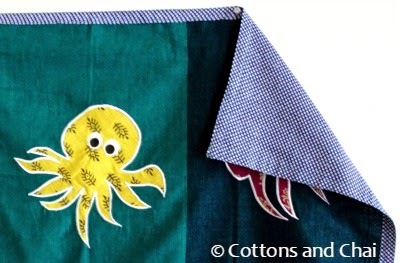 We're really excited about participating and showcasing our work alongside some tremendously talented quilters..and so we'd like to take this opportunity to enter our second project - the Seabed Blankie quilt - in the Applique Quilts category! Before moving to Minneapolis earlier this year, I used to design, make and sell fabric products and accessories in Bangalore, India under the brand Kala Koyree. This quilt was one of the products I designed for our Kids category. Over time, as my fabric stash grew and starting overflowing out of it's storage space, one day I sat down to re-organize it all and grouped all the fabric according to color. That's when I could 'sea' all those lovely solids in the most fantastic shades of blue stacked together and knew I just had to make an ocean-themed quilt. All the blue background blocks in the quilt are Indian weaves called Mangalgiri cottons. Mangalgiri is a town in southern India known for its handloom fabrics, characterized by pure durable cotton. 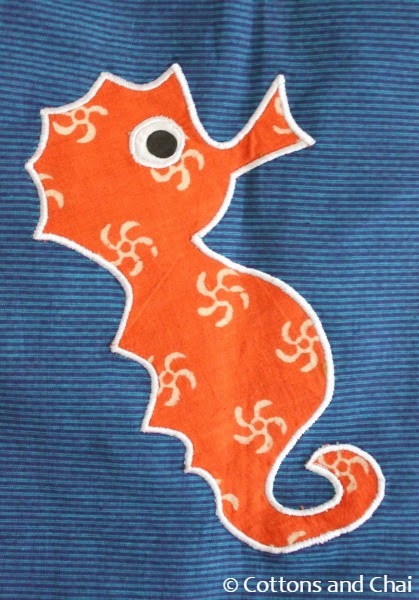 I always seemed to gravitate towards these fabrics because of their distinctive designs (some weaves have typical narrow stripes - see the seahorse applique below) and vibrant colors. I decided to keep the composition very simple 'on porpoise'. Just 6 different shades of blue in 2 rows, each housing a popular sea creature. 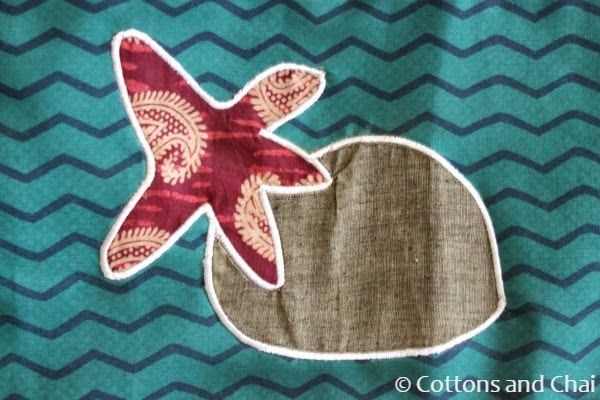 For the fabric sea creature appliques I decided to use the traditional, famous block-printed cottons from Gujarat (a state in western India) which I absolutely adore. These fabrics are typically used as dress material, but I used them in my products all the time. I started off by drawing outlines of these sea creatures and cutting them out of fabrics that would contrast well with the blue background. Each applique features a unique color and block print meant to represent the unparalleled hues of ocean residents. I appliqued the creatures to the background using a zigzag machine stitch and deliberately used white thread (as opposed to a coordinating color) so that the applique would really pop up against the dark background. Once the individual blocks were done, I decided to make the seabed using a wide strip at the bottom of a cotton fabric with wavy prints which went quite nicely with the theme. I used grey fabric to make a couple of rocks and starfish. And here's a fun block print I found in my stash - a paisley print surrounded by a spiny outline, just like some real starfish! I used a blue polka dotted fabric for backing, reminiscent of the bubbly, foamy sea. 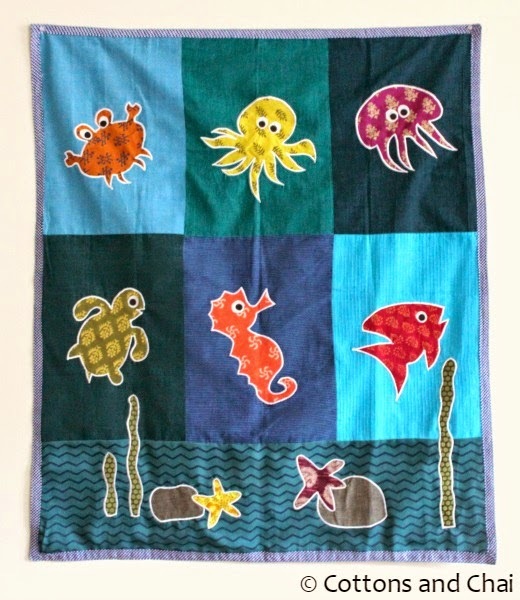 And that's our Seabed Blankie Quilt for today which will hopefully help to float away in a sea of dreams! If this quilt has got you hook, line and sinker, then please take a moment and nominate us here. Voting begins on November 1 2014. Finished Size: 42" * 34"
Very nice! I'm always a little afraid of appliqué, but you've done it very well! You workmanship is very nice. I love all of the cute little sea creatures in their fun colors. What a lovely quilt! 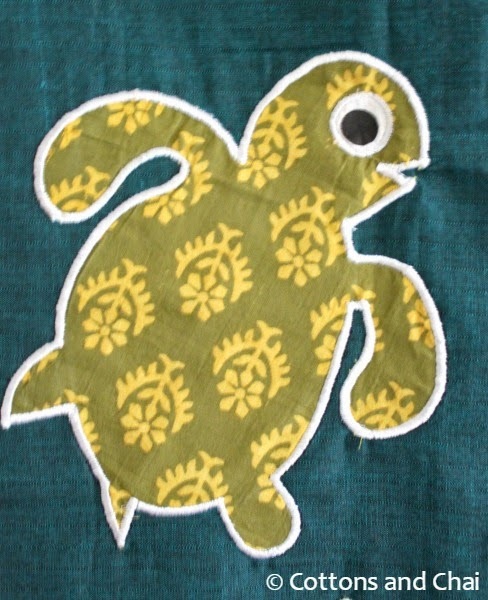 I loved the sea animals and enjoyed reading all the details, the turtle is such a cutie! Good luck! I could learn to get the ideas from you both sisters....though I love to quit and sew, getting the ideas is also a difficult job.